On August 20, 2014, I had the great privilege of attending an event to celebrate the Nature Conservancy of Canada's (NCC's) latest acquisition on the north shore of Lake Superior — 167 acres (67 hectares) on Caribou Island. Hosted by one of our supporters on nearby Lambert Island, donors and neighbours came together to raise a glass and share stories about the Island which will now remain undeveloped in perpetuity. 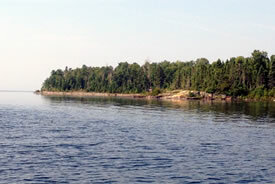 Located about 40 kilometres from Thunder Bay, Caribou Island is a much-loved piece of the landscape. It is 300 acres (121 hectares) in size and features impressive cliffs, mature forests and even an inland lake. Although uninhabited, it’s visited regularly by boaters, cottagers and others exploring the wilderness of the north shore. For decades, neighbours have worried that they would one day wake up to find "No trespassing" signs on the island. Efforts to acquire the island had been mounted before, but for various reasons hadn’t borne fruit. As you can imagine, everyone was very happy when NCC was able to broker a deal and assemble the funds necessary to protect half of the island. What stood out for me at the event was the deep personal connection that people have to the land we just acquired. At NCC our focus tends to be species, habitats and ecological services. But at the event that evening I heard stories where Caribou Island served as the backdrop for friendships forged, summer romances kindled, anniversaries marked and family memories made. I heard stories about picnics, boat trips, hikes and diving competitions. I heard about a deep love and appreciation for the land. It made me reflect on the fact the places NCC acquires are just as important for their cultural values as they are for their biodiversity values. Our properties were part of communities long before we came on the scene, and I’m happy knowing that they will remain part of those communities for evermore. I know we’re looking forward to creating many great new memories alongside our new neighbours on the north shore of Lake Superior. 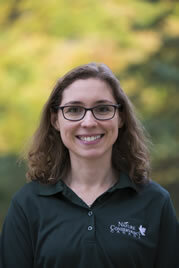 Dana Kleniewski is the director of development for NCC in the Ontario Region. Read more about Dana Kleniewski.